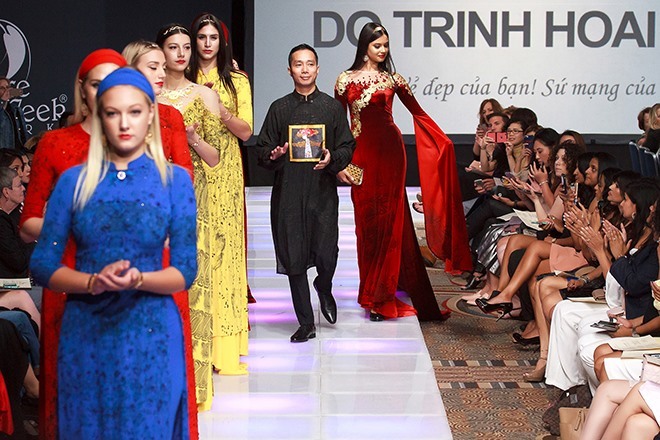 NDO – Hanoi-based designer Do Trinh Hoai Nam, Chairman of Vietnamese Ao Dai Club, shared with delight that Ao Dai (traditional Vietnamese long dresses) have changed his life, and his journey to bring the country’s cultural symbol to the world is always kept alive in his memory. In an interview with Nhan Dan (People) Weekly Newspaper, Nam acknowledged that the appreciation from international friends for the elegant Vietnamese outfit has motivated him to work harder in his career. Question: You had won much success in working on vests and dresses, what made you turn to Ao Dai tailoring? Designer Do Trinh Hoai Nam: I entered the fashion industry from a very early age. When I prepared for my wedding at the age of 21, I paid more attention to Ao Dai, which are the most picked costumes for the bride, mothers and female guests at the ceremony. I bought a guidebook of tailoring Ao Dai and made Ao Dai outfits for my fiancé, my mother and my mother-in-law on the occasion. These were the first Ao Dai I had made and they were all complimented on by the wearers. Actually, I used to prefer working on fashionable outfits, however, it came as fate that I had an opportunity to design Ao Dai for special guests, and became more passionate about the traditional gown. In 2015, I worked as a costume designer for a theatrical show entitled ‘Women in love’, and my Ao Dai designs at the show were so enthusiastically welcomed by the audience that I decided to develop my career focussing on Ao Dai. It was a tough decision, though. Do you think that it was fortunate that you have earned success with your Ao Dai brand? Ao Dai have brought about many turning points in my life. Since I decided to focus my career on the traditional Vietnamese gown, I have been invited to a number of Ao Dai festivals in Hue, Ho Chi Minh City, Hanoi, among others. My Ao Dai collection called Sen Vang (Golden Lotus) impressed the organising board of the 26th Couture Fashion Week New York in 2017, earning me an opportunity to become the first Vietnamese designer to attend the event. When my collection was chosen for the first catwalk event of the week, I was extremely happy and nervous as it was the first time that Vietnamese Ao Dai excelled on such a prestigious global fashion stage. By participating in the event, I realised my aspiration to promote the influence of traditional Vietnamese culture to the world, raising awareness of Vietnamese people in valuing and protecting their culture, while helping foreigners to admire the beauty of Vietnamese culture. Following the success of ‘Golden Lotus’, I was then invited to many fashion weeks around the world, where I have introduced Ao Dai to international friends. In January 2018, my ‘Women in Love’ collection’ was chosen to open the Paris Fashion Week-Haute Couture and won much applause from the audience. Witnessing Ao Dai designs on the international stage has fuelled my motivation to bring the traditional outfit to more major fashion events in the world. You must have received many impressions from international friends for your Ao Dai designs. Can you share one of your memories about this? When I brought my ‘Golden Lotus’ collection to New York, I impressed the organising board of the 26th Couture Fashion Week New York’ and was invited to the first catwalk event. International models also showed their interest in donning the elegant outfit of the Vietnamese people. At the Paris Fashion Week-Haute Couture 2018, I blended French cultural features into laps of Ao Dai, receiving a lot of clapping from the attendants. Many international celebrities met me after the event to order an Ao Dai of their own to attend the Cannes Film Festival. The order inspired me to design the collection ‘The World As I See It’, which was printed with the national flags of countries attending the Cannes Film Festival. The collection was then featured on the red carpet at the festival, creating special emotions for me. There must be difficulties to conquer the international fashion stage, can you share some of them? The high bar of requirement set by international organisers is very challenging for Vietnamese designers. The expense for participating in such events can discourage many designers. For example, it might cost you tens of thousands of Euros for a major fashion week, excluding payment for your team, whose qualifications must meet the requirement of the organising board. It is not to mention the fierce competition at professional platforms, which gather many famous names in the fashion industry. You were honoured as ‘Designer of the year 2017’ at the fifth annual Ao Dai Festival in Ho Chi Minh City in 2018. Can you tell us about the title and your plan in the future? It was a great honour for me to receive the title. In 2019, I plan to work with the Vietnamese Women’s Union to open a training course on tailoring Ao Dai in Hanoi, targeting disadvantaged women. We are also working on a display of Vietnamese Ao Dai collections through different historical periods at the Centre for Women and Development in Tay Ho district. I have also opened many training courses on Ao Dai to hundreds of students with the hope to promote the love for Vietnamese Ao Dai among younger designers.